Near-beach condo on Sanibel Island, Florida. These terrific 44 condos are just across the street from Sanibel's famous beach, with included private beach easement. A community pool and tennis court are also included in this popular vacation spot! Perfect for personal use or to put in the on-site rental program. 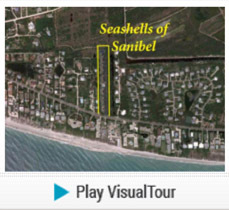 Seashells of Sanibel condos usually sell quickly.